Being able to walk your dog in the countryside is wonderful: you can get away from the hustle and bustle of everyday life, take some time for yourselves, and see some beautiful landscapes along the way. But, it’s very different to walking your dogs in the suburbs, or through your favourite park. Exploring rural areas comes with a unique set of risks, and you should take steps to avoid or prepare for them. Here, we’ll share our top tips for enjoying a safe and relaxing countryside walk with your furry friend. Read on to find out more. When you’re exploring an area or route you’re not familiar with, it’s difficult to know how long a walk will take you. And, it isn’t always easy to work out how demanding a country walk is going to be. As a result, when you’re preparing to take your dog for a walk in the countryside, it’s important that you pack plenty of water, so you and your pooch don’t get dehydrated along the way. It’s vital that you remember to pack a water bowl for your dog, too. If you’re short on space, Millbry Hill has a selection of collapsible water bowls in their dog travel accessories department. If you’re walking through an area where you’re likely to encounter cows or sheep, you should keep your dog on its lead at all times. It’s also important that you keep your pet under control, and give any livestock that you do see a wide berth. While people are rarely attacked by cattle, it can happen — especially when they have calves they want to protect. So, while you should always be alert around livestock, it’s vital that you’re especially wary in the spring and summer months. If you’re walking past a herd of cattle and sense that they’re feeling intimidated or aggressive, you should let your dog go — they’ll easily be able to outrun the cattle — and get out of the field as quickly as possible. When you’re exploring the countryside with your dog, we would always recommend sticking to the popular walking routes. This is because the ground is likely to be easier for you and your dog to walk on, these paths tend to be away from livestock, and you might encounter other walkers who are exploring just like you, which can help you to feel much safer when you’re out in the wilderness. Staying on an existing route will also help to prevent you from getting lost, which is especially important if you’re walking in an area you aren’t too familiar with. 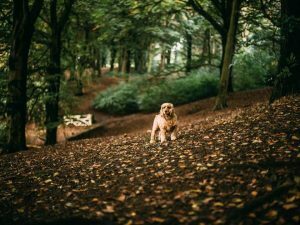 In order to keep both you and your dog safe while you’re out exploring, you should follow The Countryside Code devised by the Department for Environment Food and Rural Affairs. The code states that, while you’re out in rural areas, you should always keep your dog under effective control, and make sure your pooch isn’t a danger or nuisance to farm animals, horses, wildlife, or other people. You should also keep an eye out for any signs that are relevant to you. This is because dogs might be banned from certain areas, or your pet might have to be kept on their lead when walking through a particular field. For example, the access rights that apply to open country and registered common land require dogs to be kept on a short lead between 1 March and 31 July. Walking in the countryside can become a lot more dangerous when the weather conditions are poor. Heavy rain can reduce your visibility, while snow can quickly turn trails into slush. Walking in the summer can pose its own dangers too, as travelling long distances in the sun could lead to you overheating or becoming dehydrated. You should always check the weather forecast before you set out on a walk in the countryside. This will help you to ensure that you have all of the necessary supplies, and you’ll be able to decide whether you should put your trip off until the weather improves. If the free weather app you already have on your phone has let you down too many times, pick a new one from The Independent’s round-up of the best. You’ll never have to worry about running into an unexpected shower again.